Free standart worldwide shipping on all orders! 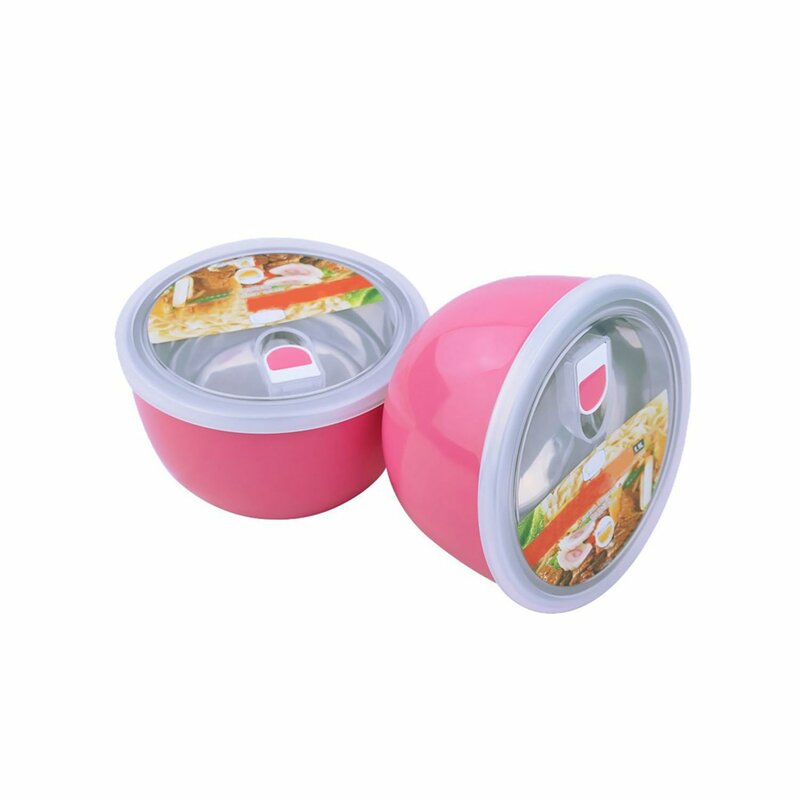 Our products do not contain Bisphenol A / S.
Our meal containers created from food grade PP. A wide variety of colors, sizes and shapes. 100% Secure Payments. All your data protected under SSL/TLS protocols. 100% Money Back Guarantee. Full Refund if you don't receive your order. Free WorldWide Delivery to over 120 countries. If you are looking for some quality bowls that allows you to store all kinds of food items easily, then these set of 2 Pink bowls is your ideal choice. 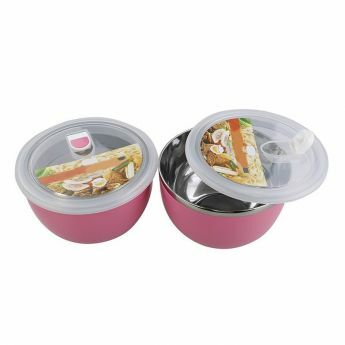 This stylish looking and reusable stainless steel food storage bowl come in a pair of two and hence you get 2 bowls for a price of one. And one more interesting aspect about these bowls is that they come with safety lids that ensure that your food stays intact for a long time. Made using from high-quality plastic and stainless steel, these storage bowls comes with a capacity of 210 grams per bowl. When you look to store items like yogurt, soups, and juices in a bowl, you definitely worry that it will get spilled over easily. But these 2 stylish pink bowls come with a safety lid that is 100% leakproof and removes all your worries about leakage and spillage. 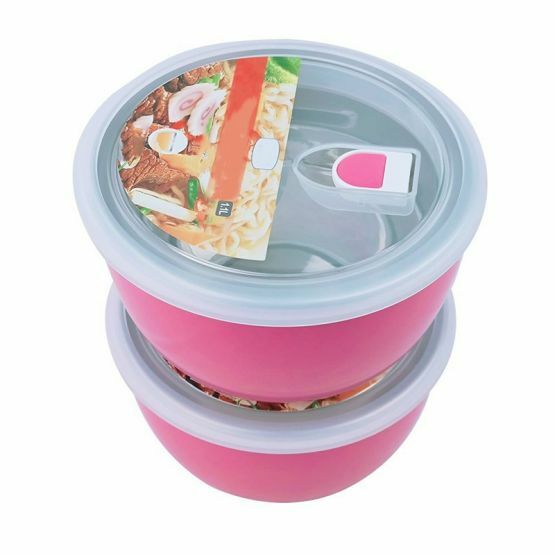 The reusable and eco-friendly pink bowls are perfect for carrying all your favorite food along with you while going on weekend trips, schools, and offices. 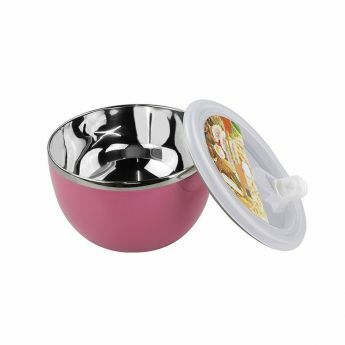 The bowl also has a small opening on top of the lid to ensure that you can easily pour out or even fill the bowl with soups or juices without needing to open the entire lid. This is especially useful for people who are in a hurry and to look to do things quickly. These bowls are also versatile bowls as you can use them in multiple ways as you can store foods, use them to mixing or also for prepping while cooking. 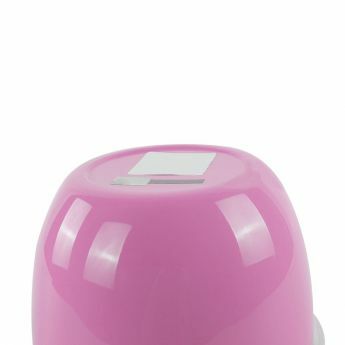 The lid on top is designed in a transparent manner to allow to see the contents in the bowl easily without needing to open the entire lid to see what’s inside. Our international shipping services are currently available in more than two hundred countries and islands across the world. This gives us a tremendous degree of flexibility, in terms of whom we can ship our products to. Keep in mind that we are actively working to add more countries, islands, and other destinations to our list. If we aren’t shipping to your neck of the woods, there is a good chance that we will be able to in the near future! Check back often! Regardless of where you live, we want you to have the best experience possible. This is certainly something that can be extended to your experience with the shipping side of things. We love the opportunity to bring tremendous value and more to our customers around the world! From our facilities in China, your package by either ePacket or EMS. This is going to depend on not only the size of your order but on the weight, as well. If your package is being shipped from our U.S.-based warehouse, we will use USPS. Do You Ship Products Around The World? We most certainly do! As mentioned above, our shipping services currently include more than 200 countries and islands throughout the planet. In the event that you are located in a place that we do not ship to, we will be in touch to discuss your options. In many situations, we can come to some sort of resolution! What Do I Need To Know About Customs? Once your items have been shipped to you, keep in mind that we are not responsible for any fees that may be incurred during the process of your package moving through customs. In purchasing our items, you are also consenting to pay any fees related to the customs process that may come up. These fees can vary from one location to the next. In some situations, there will not be fees at all. *Please note that none of the times mentioned above includes your 2-5 day processing time. Once your order has been shipped, we will send you the tracking information, making it easy to keep up with the journey of your order. What If The Tracking Says No Information Is Available? With certain shipping companies, it can take anywhere from two to ten business days for the tracking info to appear. How Will The Items Be Shipped? Even if you specifically asked for combined shipping, there are going to be situations in which it makes more sense to use multiple packages. Even in these situations, it is likely that your order will still be shipped entirely on the same day. How To Cancel Your Order? Until it has been shipped, any order can be canceled. You can also contact us within twelve hours if you need to make any changes to the specifics of your order. Do You Need A Refund? When necessary, we are happy to extend a refund option to our customers. If you have not received your product within forty-five days (doesn’t include 2-5 days of order processing), you can request a refund. This can also be extended to receiving the wrong product. If you simply don’t want the product, remember that shipping it to us is your responsibility. Your order did not arrive due to exceptional circumstances outside the control of LunchBox.Sale (i.e. not cleared by customs, delayed by a natural disaster). © Packed for you by LunchBox.Sale – Your guide of Lunch Boxes world.